Pets are family too and that is why we welcome them accompanying our guests. Are your pets protected against ticks? Unfortunately, they will definitely need to be protected. Pets are generally well behaved and their owners completely responsible, but we find some need to have a few pointers. So, please keep your pet off the linen and the furniture - especially if they tend to lose hair. There is a maximum of two pets only. We provide two bowls only. You will need to bring your pet's own bedding. Our showers aren't for washing pets. Nor should the towels provided be used to dry your dog. There are outside taps where you can wash and dry your pet. Pets should not be left alone in the cabin. 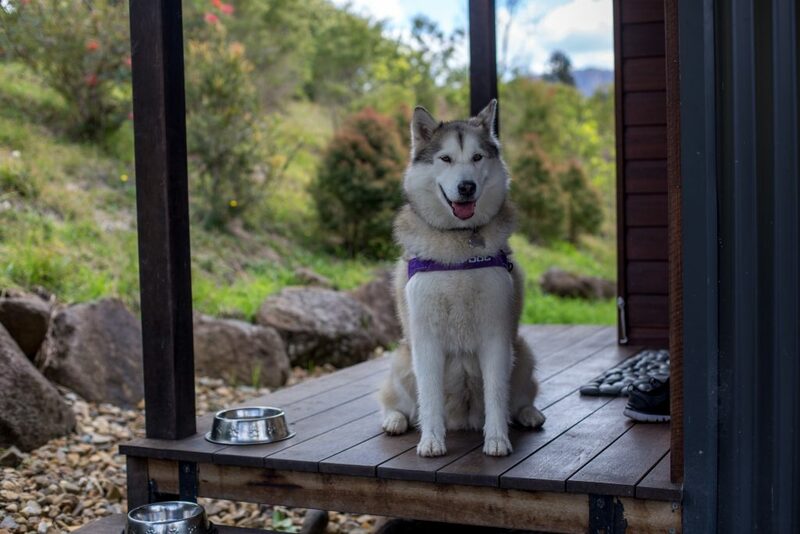 We appreciate our guests co-operation in this matter as we are keen to continue to make our cabins welcoming to pets. We say more about pets on another page. When Can We Arrive and When Do We Have To Leave? Our Checkin (Hello) time is 2pm. Our Checkout (Farewell) time is 10am. However, if you wish to come earlier, and we can accommodate this, or you need to do is contact us a few days before your arrival day for confirmation. At Wongari we try to create a space that is natural and stress free. In order to acheive this we think that it is important to have a technology 'detox'. We are so tuned into our fast paced and busy built environment that we neglect our natural one. We need to disconnect the one in order to re-connect to the other. It's in our genes you might say. 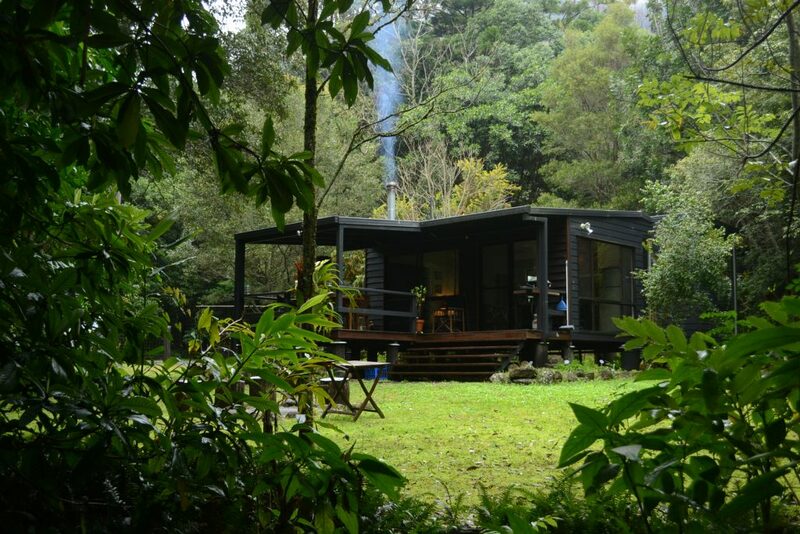 So we offer a self-contained cabin without a TV, without mobile reception and without wi-fi. Wongari is a 'technology-free' zone. And, for once, even if it is for a little while, you are off-grid, uncontactable and free to relax, unwind and re-connect. At Wongari we see the absence of technology as a service to you. We welcome you to try our 'detox'. You will be surprised and pleased at the difference it makes. Is Your Kitchen Fully Equiped? Our kitchen has everything you may need or want. 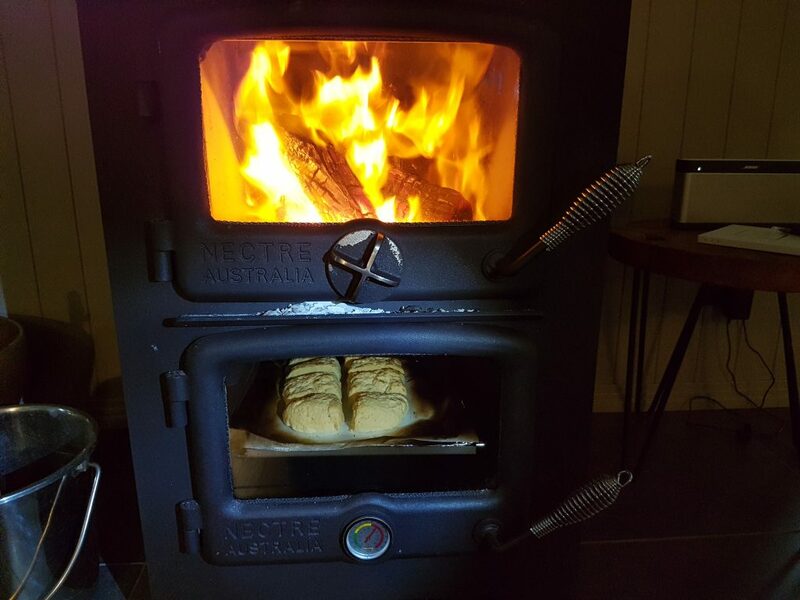 From a generous size fridge to wood-fired oven (best used in Winter). We have all the implements and utensils that a good kitchen should keep as standard. 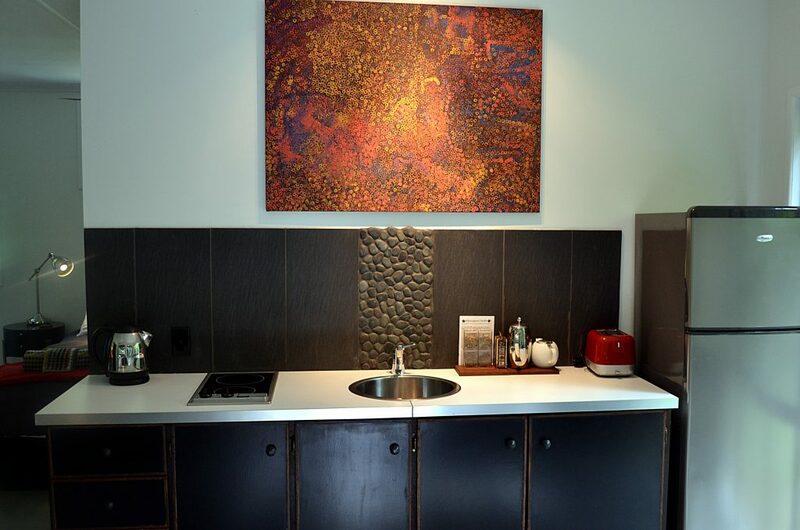 If you wish to relax on your stay here by testing your culinary skills then you will be well catered to at Wongari. What Is The Difference Between The Two Cabins, Serenity and Bimbul? While the two cabins are very different in some respects and totally the similiar in others. But, in brief, I can tell you that the essential difference, in a collective opinion of sorts, is that Serenity is buried in a forest just 15m from the creek and is very, very private. In winter you really do appreciate the fires. But it also has AC. 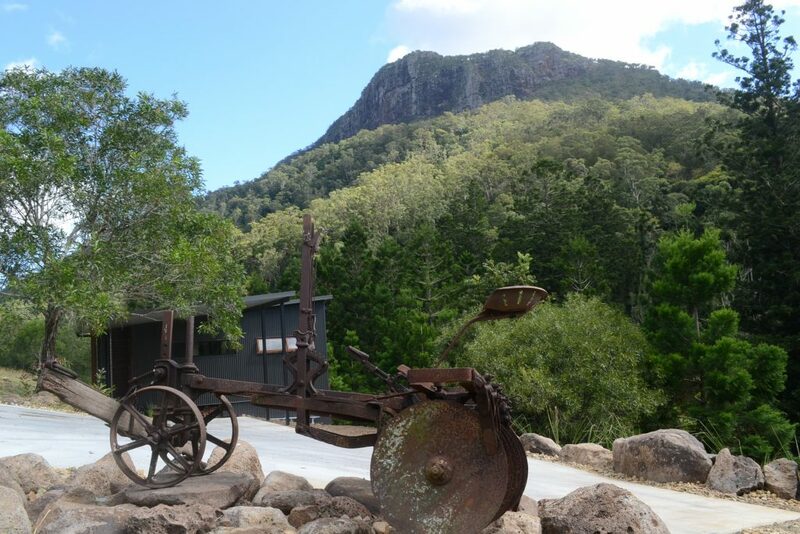 Bimbul, on the other hand, is much more open to the views and sits at the canopy level of a grove of Hoop Pine trees. It is about 50m from Christmas creek which you can see and hear always. Bimbul is run by renewable hydro-electric power and has expansive views, is private and has a north-east aspect that really is taken advantage of by Bimbul's 'picture frame' daybed. Otherwise, both share all the comforts and amenitities that you would expect in a truly self-contained cabin. There are a number of walks nearby our cabins that we often recommend to Guests. 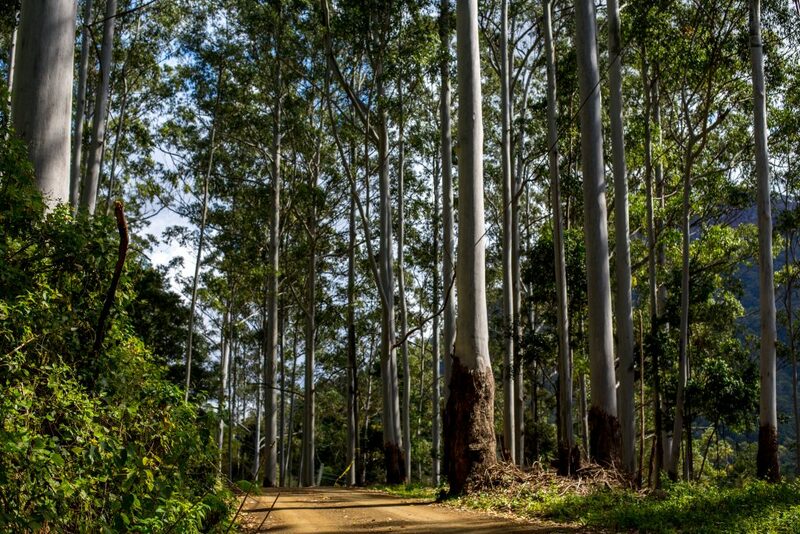 The most convenient and popular is to simply walk our 6 kilometer stretch of Christmas Creek Road. Around every bend is a vista and the valley neighbours are very friendly. 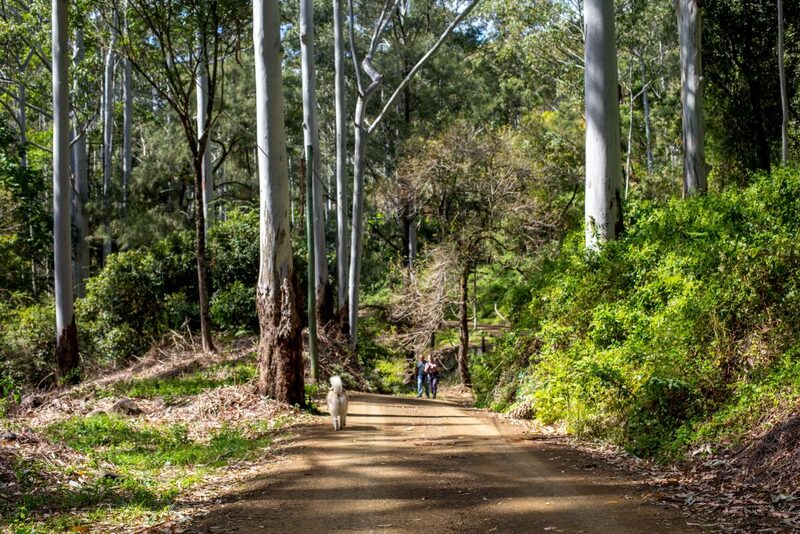 For a more serious walk you can start at the Lamington National Park entry just two more kilometers from the cabins at the end of Christmas Creek Road. You could start with Westray's, continue on to Larapinta Falls or, for a more challenging walk, go vertical to Stinson's Plane Wreck site and Point Lookout. I Hear Bimbul is Powered by a Hydro-Electric Turbine. What's That!? 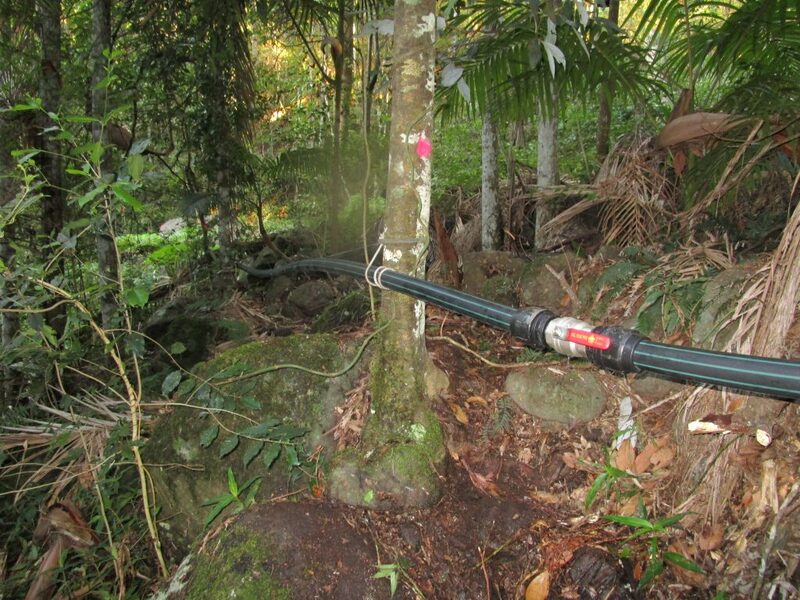 We have a Powerspout PLT hydro-electric system that generates all the power our cabin requires: plus some. Soundproof but Can It Breathe? It is the best renewable power source available. It uses water that goes straight back to Christmas Creek; it is 24/7; we consume nothing; and it has created its own little creek we call 'Bimbul Creek'. 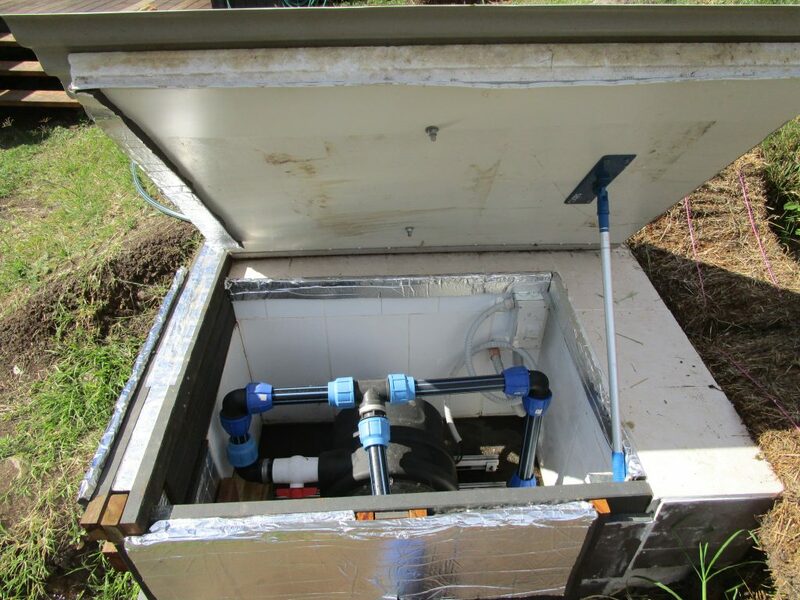 Of course you have to be lucky enough to have permanent water in a convenient place to throw your pipe. 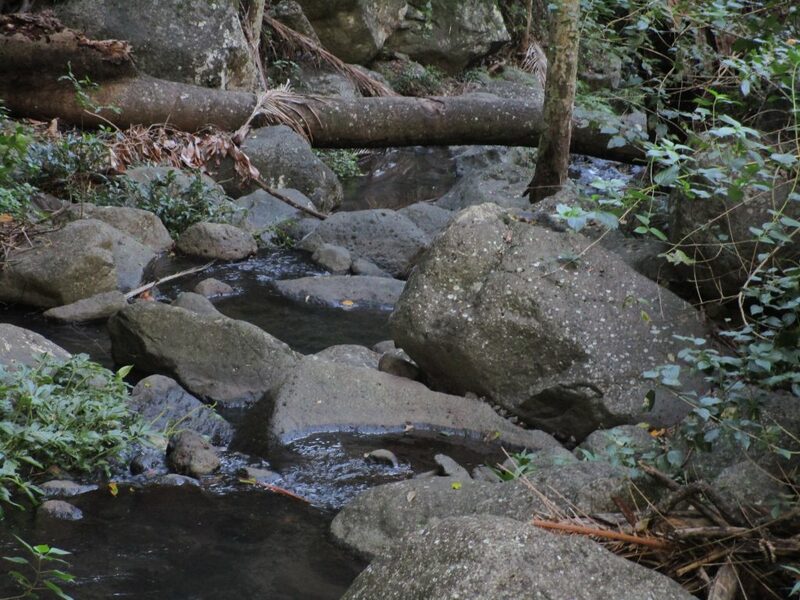 In Waterfall Creek, coming as it does from Lamington Plateau, we have the best creek ever. But the service doesn't quite come with a flick of the button. There are certain behaviours that our guests are requested to observe. Like, use power (the hydro needs to know it is being loved); like, 10-15minutes of shower time in a day; like using some power at some time even if you are happy to use none at all (really! our turbine loves to be used); like, don't use all the appliances at the one time. The only downside to our hydro system, as much as I can tell, is that the occasional tree or flood may take out our pipe. But that is more than made up for when Energex loses power but Bimbul doesn't. It's a Great system. You'll love it we're sure. Do You Provide the Fire-Wood? 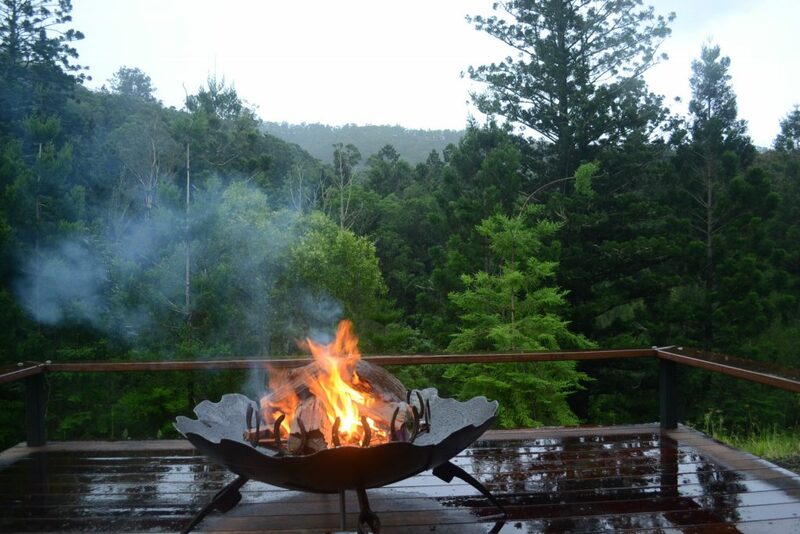 Both cabins have indoor and outdoor fireplaces.